Consider a composite conductor which is made up of two or more strands which are in parallel. For simplicity let us assume that all the strands are identical and share the current equally. The sum of the currents in all the conductors is zero. Such a group of conductors is shown in the Fig. 1. The conductors 1, 2, 3, ... n carry the currents , , .... n carry the currents I1, I2, I3 ... In. 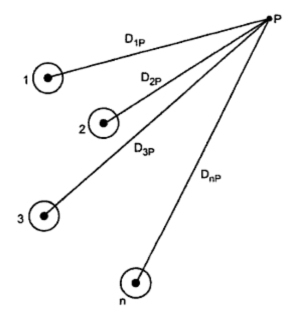 Let the distances of the conductors from a point P be D1p, D2p , D3p ... Dnp respectively. Let ψ1p1 be flux linkages of conductor due to its own current I1 due to internal and external flux. The flux beyond point P is excluded. Similarly the flux linkages ψ1p with conductor 1 due to all the conductors in the group but the flux beyond point P is neglected. The sum of all currents is zero. All the flux linkages of conductor 1 are included in the above derivation. The above expression is valid only only if sum of the currents is zero.